3D printing is coming into its own. No longer relegated to the professional sector, anyone who has the cash can essentially join in the fun with a Makerbot or a RepRap. But FormLabs has found a way to bring the high-end performance of top-notch machines down to the price of a Makerbot. Yesterday, they launched the Form 1, an affordable, professional 3D printer, on Kickstarter with the goal of reaching $100,000 in funding in one month. Today, they’ve received about $660,000 and have over 400 backers. And the number keeps climbing. I spoke with co-founder Maxim Lobovsky about his sudden success, asking him how the Form 1 differentiates in the space. Essentially, there are two groups of 3D printers, the high-end professional machines and the hobbyist machines. The high-end printers cost anywhere between $10,000 and $1 million, whereas hobbyist machines cost between $2,000 and $3,000, yet don’t have the same high resolution output. “We see Form 1 as the first 3D printer that takes affordability to the high-end, professional level,” said Lobovsky. To give you some perspective, Makerbots start at $2,199, and the most basic Form 1 pledge you can make on Kickstarter is $2,299, and includes “the full Form 1 package including the printer, 1L resin, and Form Finish Kit.” Clearly, Formlabs isn’t looking to undercut price, but then again, this isn’t another hobbyist 3D printer. Lobovsky believes his competition lies with the professional machines, and in terms of those costs, the Form 1 is a steal. There were only 25 spaces for the basic Form 1 package, which sold out almost immediately. The Form 1 uses Stereolithography to help makers product their designs. It’s considered the “gold standard” in 3D printing, using a high-precision positioning system to direct a laser onto a tray of liquid resin. This achieves “dramatically better resolution,” according to Lobovsky. But perhaps more important than the technology is the ecosystem around Form 1. The guys at FormLabs have created software that imports .STL models from any 3D CAD package, supporting structures for complex geometry. And after importing, it only takes a few clicks to get the machine fired up and printing. This allows any designer or engineer, from the professionals at major corporations to the students putzing around in SketchUp, to enjoy the same high-performance as big companies. According to Lobovsky, there’s no magic formula or secret sauce to Kickstarter success, though he did say they spent extra time and effort on the video and imagery within the post, as well as honing their message. We’ve seen a few stories like this, namely that of the Pebble smartwatch, yet all of the shining stars of Kickstarter are very different. Rather, it’s the demand for this product that has led to such success. 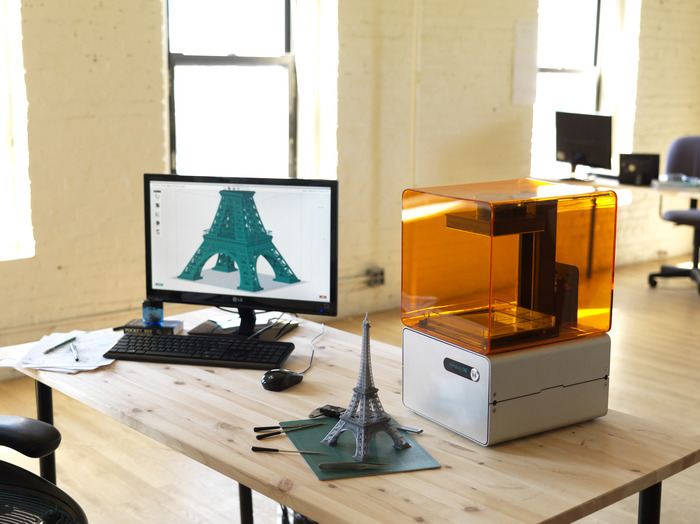 FormLabs claims there are around 30,000 professional 3D printers installed around the world. However, approximately 10 million people actively use 3D CAD software. FormLabs simply aims to fill in the gap. The most amazing part of this already-amazing story is the way that FormLabs was able to bring down the cost of the machine. Lobovsky says it was thanks in large part to three different factors. The first is that the team used a new kind of laser, specifically a 405nm Bluray laser diode. In the past, the lasers used to run these professional 3D printers have cost more than the machine itself. 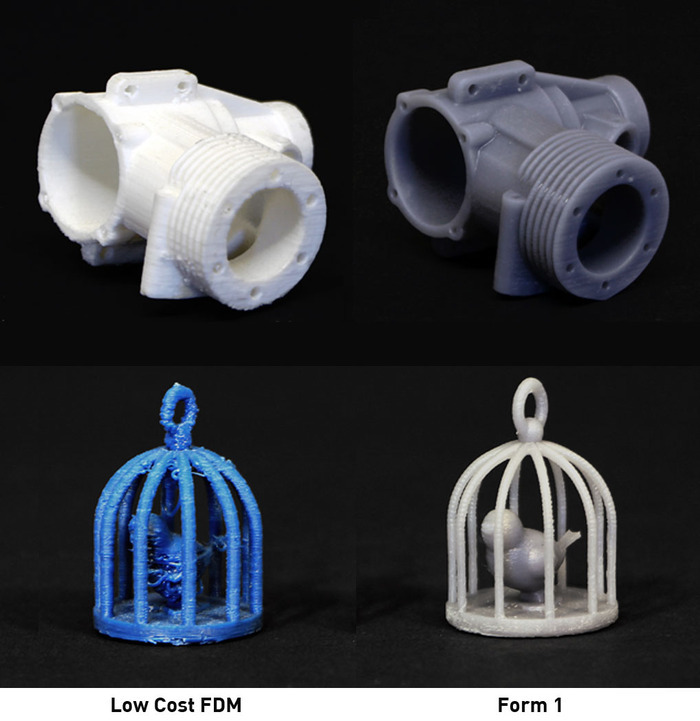 With this new type of laser that only recently came on the market, FormLabs was able to keep manufacturing (and thus market costs) down. The second factor was the expiration of a few patents, meaning that the team didn’t need to pay high licensing fees to get this product to market. Finally, and most importantly, FormLabs was able to look at all those high-end, $10k+ machines, and essentially decide what was necessary. It took FormLabs just under three hours to reach their goal, and with the way this number keeps climbing, I wouldn’t be surprised if they surpassed Pebble’s $10.27 million in funding by the end of the month. Dror Berman, Founding Managing Director of Innovation Endeavors, expressed enthusiasm at the early-stage success of the Form 1 in an email.